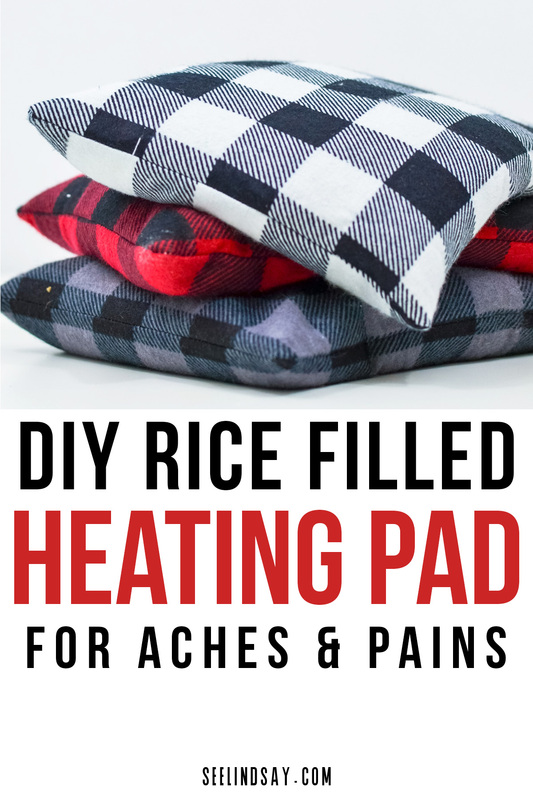 Add this simple Rice Heating Pad to your companion list on those cold winter nights. 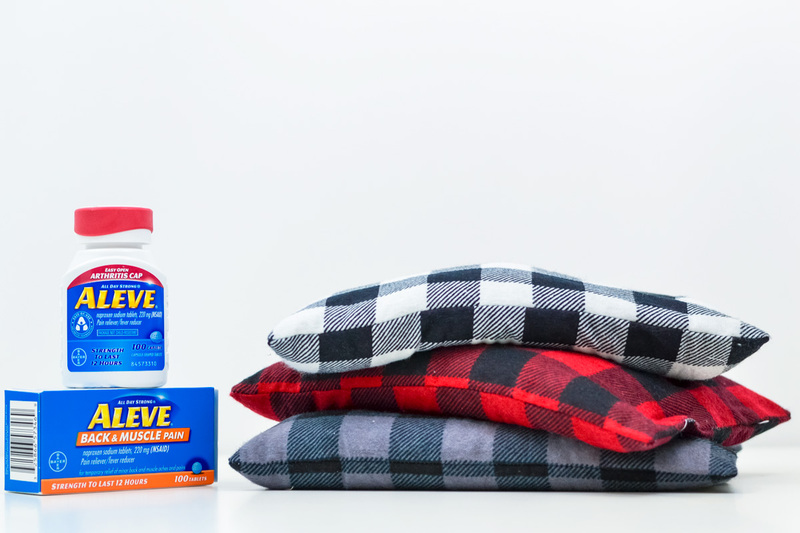 Warm these DIY heating pads in the microwave and simply reuse them for whenever you need a heating pad that doesn’t use electricity. Just this past week I got a call from my oldest son that he had thrown out his back. This was like de-ja-vu to the time when I started getting back pain when I was younger. He said he twisted to stretch his back and it just gave out on him. He had the hardest time in the car on the drive to take him home. I gave him some Aleve Back & Muscle Pain that I had on hand and told him to go lay flat on the floor on his back with this DIY Rice Heating Pad. I started getting back pain around age 13. I’ve seen specialists, physical therapists, alternative medicine doctors all to try and get my spine to act the way it’s supposed to act. I still have good days and bad but, taking Aleve Back & Muscle Pain when I have a flare can help neutralize the pain that my back causes me. I know this is the same route my oldest son is headed. It’s a good thing for me as a mother to have experienced this same issue so that I can assist him in him finding what medicines and routines work for his own back pain. I know that for him and I, heat works the best to help calm down the back and muscle pain. Find what works best for you and if ice is better for you, do that in conjunction with some OTC medication or prescribed medication. I’ve decided to make us some rice-filled heating pads that will warm up in a few minutes and can be taken with you wherever you may be. Just warm these homemade rice heating pads in the microwave and it will retain its heat for around 15 minutes. That’s the perfect amount of time for heat therapy that works for me. How do you make a Rice Heating Pad? 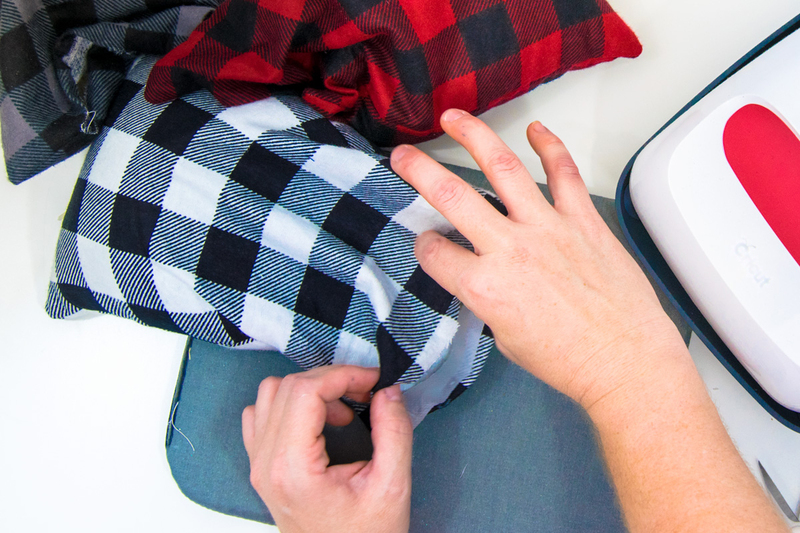 To make your DIY rice heating pad, you’re going to need a few things. I used my Cricut to cut the flannel but you can just use a rotary cutter if you do not own a special crafting tool. I’ve included the special file for the rice heating pads that you can cut with your electronic cutter or just cut your fabric to be 8”X11”. 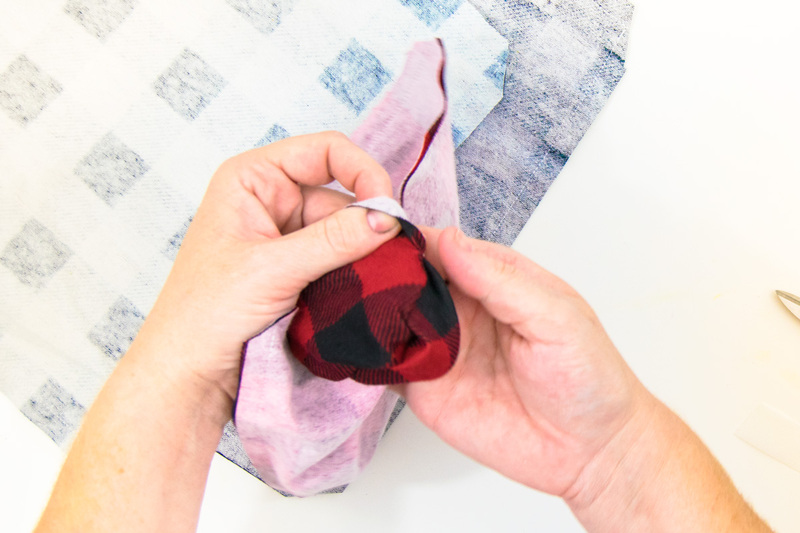 You’ll lay right sides together and sew a ¼” seam around the edges. Reinforce your first and last stitch so that the fabric won’t unravel as you add your rice. Leave a 3-4” opening at the top. Grab a small plastic or paper cup and remove the bottom so that this will act as a funnel for your rice in your rice heating pad. 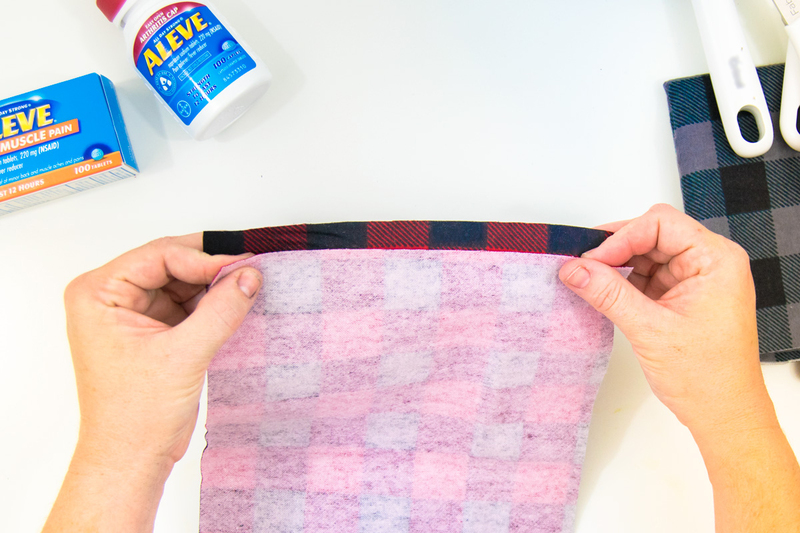 Fill your DIY rice heating pad with the rice and then use some Heat n’ Bond tape to seal the edges. You can top stitch if you’d like but that’s just one extra step for me. Use your iron to seal the edges by pressing for about 30 seconds. That’s it for automatic relief and it’s inexpensive. Heating pads at the store have cost me upwards of $30 and so if I can make this for pennies, why not you either? How long do you heat Rice Heating Pads? Start heating your rice-filled heating pad at one minute. 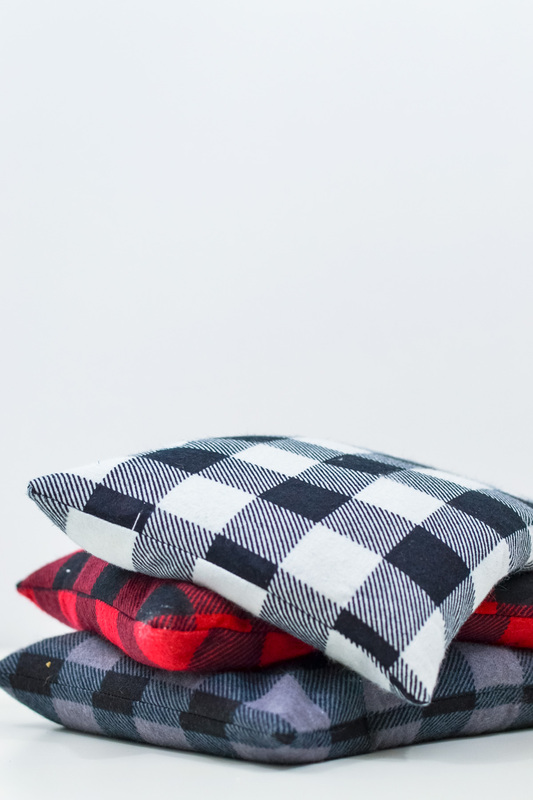 Two minutes in the microwave if you want your DIY rice heating pad to be extra warm. Keep an eye on your heating pad so that it doesn’t smoke. Just warm your heating pad at one-minute intervals in the microwave. I’m dedicated to helping heal my son and I want him to have a fulfilling life free of back pain. He is a lover of sports and I’m so happy to see him at his happiest on the field. 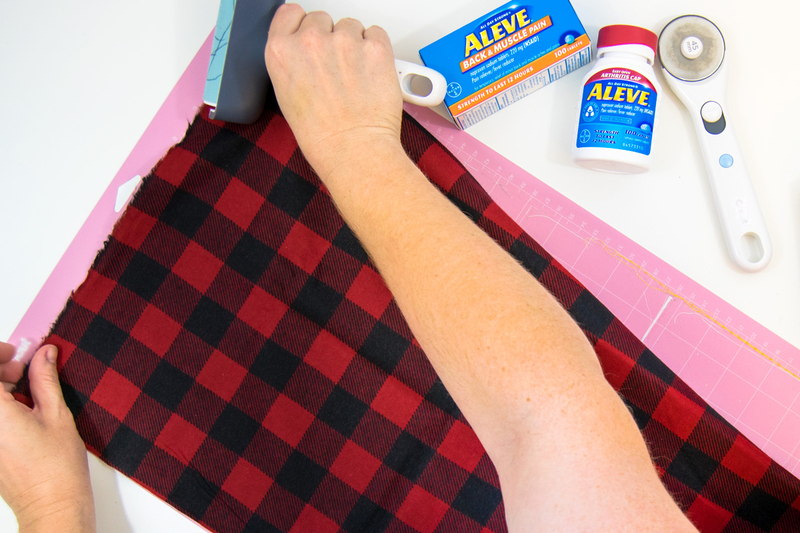 Making this homemade heat pack is so easy and you’ll be on your way to an all natural health kick. Turn this into an aromatherapy heating pad by using a few drops of essential oils. Go Away! Not really but that’s what I want to tell people when I’m trying to sleep. Create this DIY Sleep Mask using your Cricut Maker and grab the free cut file to use with any cutting machine. This post contains affiliate links. Thank you for your support. There is nothing more important than taking care of yourself. 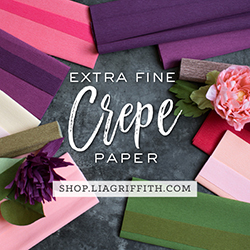 I’m joining in with a few other bloggers to share different ways to take care of yourself and to show you other self-care items you can make with your Cricut. 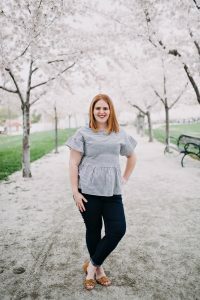 Jessica with The Do It Better Yourself Club has released a fun woman’s pajama pattern and to celebrate she’s put together a free ebook with all of our projects. Check it out here. Begin by uploading the Go Away! png into Design Space. You can use this method here. 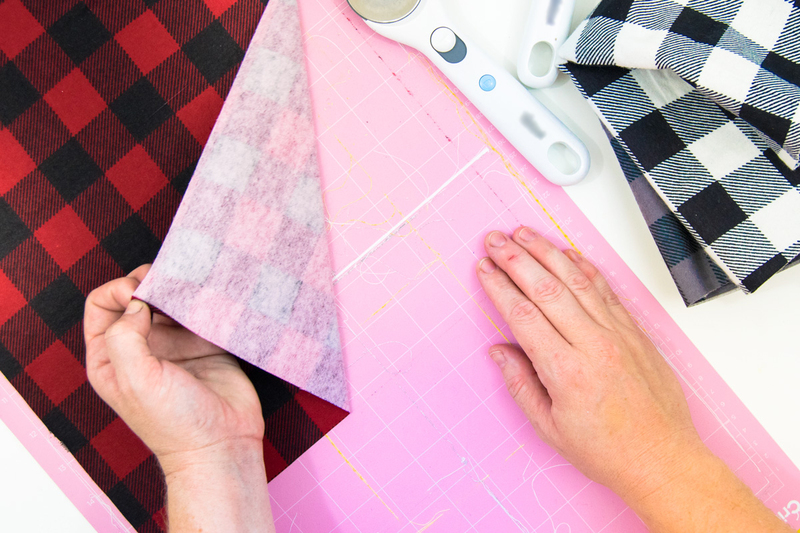 Cut your interfacing to size so that it will fit your pink fabric mat. When cutting fabric, you want to have it right side down. Use your rotary blade to cut both the interfacing and the cotton material. Now cut your Go Away! image using a coordinating color of Iron-On Vinyl. When cutting the vinyl, be sure to mirror your image and to use the fine tip blade. Apply your image to your sleep mask before you being to sew it. Use an iron using these settings or use your EasyPress at 305°F and press for 25-30 seconds. Warm up your surface first for 10 seconds, press and then turn it over and press again for 10 seconds then peel. Take your cotton front and place the elastic band so that the ends are meeting with the ends of the mask. Now lay your other cotton piece, right sides facing together, and then lay your felt interfacing on top. Sew a 1/4″ seam 3/4 around your DIY sleep mask. Turn it so that the cotton pieces are facing out and your elastic band is secured. Press the mask so that it lays flat and tuck in your fabric edges that weren’t secured originally. Top stitch over the sleep mask completely and you’re set to have the best night sleep of your life! For me, sleep is always hard, because with Fibromyalgia, your brain never shuts off. My mind is always going and I seriously have the weirdest dreams. Using a sleep mask (and some Tylenol PM) is really the only way that I know how to get a good night sleep. Everything is dark and I have zero distractions. It’s pretty easy now but it has taken a long time to get to this point. Milestone baby blankets are everywhere. Learn how to use your Cricut and the Cricut EasyPress to create your very own monthly milestone baby blanket to have as a keepsake for your little one. I’m so excited to be joining the Inspire My Creativity Link Party each month until June this year. It’ll bring some new challenges which I always love. Link up your post below! This month is DIY anything your heart desires. This DIY milestone baby blanket was so easy to create using my Cricut Maker and using my Cricut EasyPress to secure the iron-on. Begin by installing the Autumn in November font to your computer, the link is below. If you’re creating doing this on your tablet or phone, you’ll have to choose a Cricut font that works. Each number is 6″ tall and about 6″ apart. Lay it out beforehand to help reduce the stress of making the milestone blanket. Next, cut out each number and I’ve also included the words month and months if you want to add that at the bottom. When using Cricut Iron-On, it’s important to remember to mirror the image. 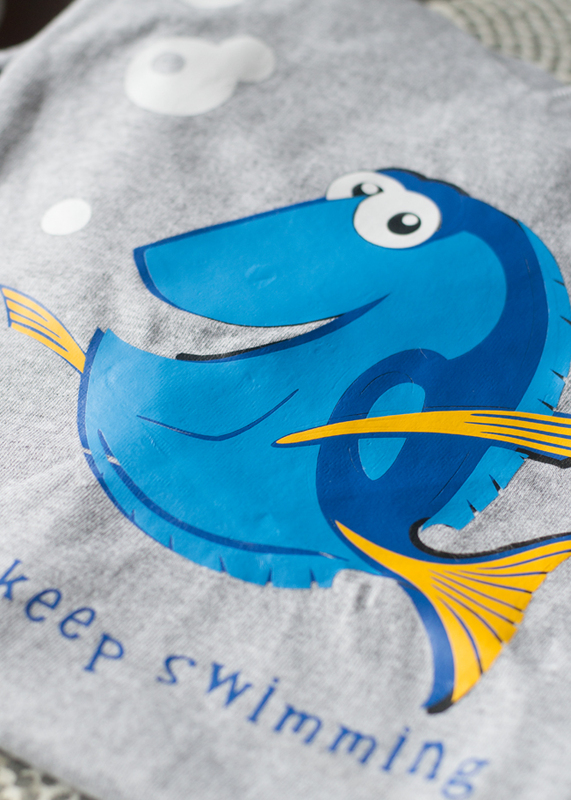 You’ll want to place it shiny side down on the mat and cut using the iron-on setting. Do not use the HTV setting with your Maker. For some reason, it is cutting completely through. You just want it to cut the vinyl and keep the carrier sheet intact. you’ll remove all the negative space and then cut each month number separately so that you can lay it out before you press. I did not follow any milestone blanket template. I laid them out and used my eye to make them even. There is a big difference between 1 and 12 so you want to make sure they’re spaced how you want them beforehand. The nice thing about HTV or Iron-On Vinyl is that when you removed the excess from the carrier sheet, it leaves you with a sticky carrier sheet that can adhere easily to your milestone blanket. 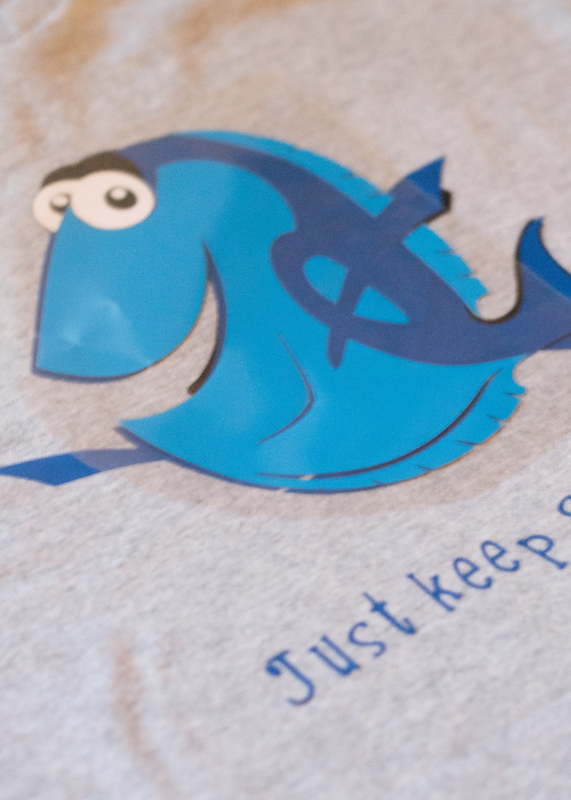 When using the Cricut EasyPress, you need a hard surface and then a folded towel on that hard surface. They have now released some Cricut EasyPress Mats that take all the guesswork out. You do not want to use your EasyPress on an ironing board. You want a tiny bit of cushion under your project. Do not press directly on your hard surface. 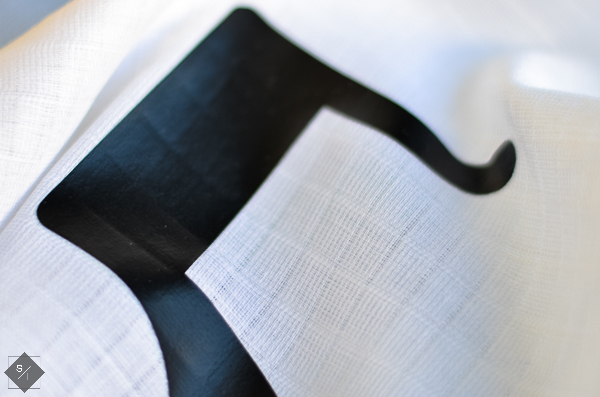 You know you’ve got a great adhesion when you can see the texture of the cotton weave come through the Iron-On Vinyl. 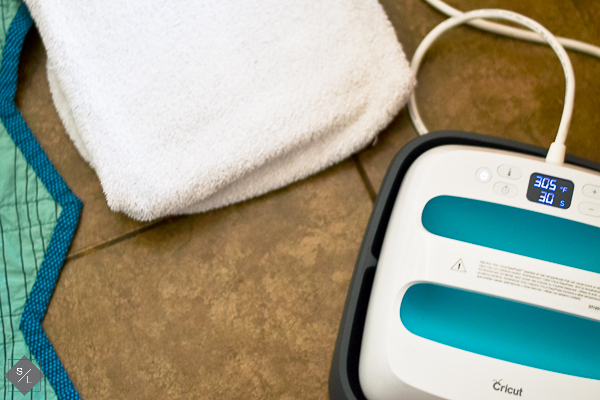 Preheat your Cricut EasyPress to 305ºF and lay your cotton on your mat or towel. Warm up your material for 5-10 seconds to take all the moisture out of the fabric. Lay your Iron-On Vinyl where you want it adhered and press for 25-30 seconds. Peel off the carrier sheet and finishing pressing the rest of your milestone numbers. Once you’ve adhered all your numbers are words, turn the blanket over and press on the back of all the numbers and words for an additional 15 seconds. Wait 24 hours to wash your blankets or go ahead and prewash it and then adhere the words. Now you’re done. So super easy but it takes a little bit of time to get your numbers evenly spaced and to finish the edges of your material. You’ll never need to spend $40+ on a monthly Milestone baby blanket again. These DIY baby milestone blankets are the best baby shower gifts you can give. They’re even better knowing you put your hard work into something so special. This mermaid pillow was so fun to make with my daughter. She loved picking out the fabrics. 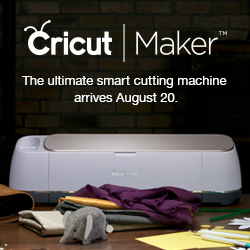 See how easy it is to make with your Cricut Maker. This post contains affiliate links. This mermaid doll was so easy to make and it was all thanks to my Cricut Maker. I used the rotary blade with the fabrics and the felt and it cuts so smooth. The darts are all included and you can choose if you want the pen to do the markings. I chose to do the markings on the face so that I could do the embroidery on it. I just used a simple backstitch to complete the eyes and lips. The flower was easy to assemble as well. I used the purple felt that comes in the felt sampler pack from Cricut. I like the Cricut felt because it is stiff. You can get a good clean cut from it and it doesn’t slide on your mat. I’ve cut different brands of felt on my Maker and I do like the Cricut felt best. Some wool felt I had would move as I was cutting or when I peeled off the mat, the entire piece of felt fell apart. It’s all trial and error when you’re cutting materials on any machine though. To assemble the mermaid doll, follow these instructions. assemble the front of the doll and then the back of the doll. Sew them together right sides facing each other and then leave about 3-4″ on the tail. Stuff your mermaid pillow doll with some pillow stuffing or I just used few snow that I bought on clearance years ago, works just as good for stuffies. Now whip stitch the opening closed. Now you can attach your flower to your doll and you’re done. This mermaid pillow doll was a lot of fun to put together. It’s the first time that I let my daughter pick out coordinating fabrics and that was a hard thing to give up. She loves her personalized mermaid doll and loves that I loved to make it for her. One day I’ll let her use my sewing machine…one day. Fibromyalgia is a rough disease to deal with. Find out how I help combat my symptoms and learn how to make this DIY Yoga Mat Carrier. This post contains affiliate links. Thank you for your support. I’ve had Fibromyalgia for six years now. It first occurred when I was pregnant with my daughter and we flew home from a visit to Tonga in 2009. I just kept having this terrible back pain that would not go away no matter what I did. When I was first diagnosed I had no idea how to react or how to even deal with this disease. There have been things over the years that have helped ease the symptoms but nothing has been more effective than exercising. Pain relief is not an easy thing to come by with Fibromyalgia but with the right kind of medications and the right kind of exercise, life can be made a little easier. The hardest part for me to deal with is that I look 100% on the outside but on the inside it feels like my body is on fire. The smallest thing can set my body into a full flare and the weather is usually what does it. Living in Utah has had many ups but the ever-changing weather pattern is not one of them. One of the best things I’ve found that helps me with my Fibromyalgia is yoga. It’s a light exercise and doesn’t use all my energy for the day. For me, when I exercise, I cannot do a vigorous workout. I have to slowly move and slowly add time to my workouts. I can’t just go all in at full speed for an hour. For me it’s been about a gradual pace and being able to feel successful rather than throw all my eggs into one basket and feel crummy later. With yoga, you need a mat – and with a mat, you need a carrier. I’m going to show you how to make your own yoga mat carrier. I already had this fabric on hand and they were already cut to 2.5″ width so I just sewed them together to make longer strips and then sewed them again down the middle to create a 5″ wide strip. I just used the length of the fabric as a starter and then later cut it down to what length I wanted my yoga mat carrier to be. The length of your yoga mat carrier is completely up to you. The loops will be around 8″ round so just take that into consideration. I like to press my seams to one side when ironing my fabric. I don’t like to have them open because I think it leaves a noticeable gap so I try to keep all my seams facing one direction. Next you’ll pin or clip the ends of the fabric to they meet in the middle, give it a good press and sandwich them together again to create one long strip. Pin or clip on one side so that you can start sewing on the opposite side to hold together your yoga mat carrier. Sew along both edges to secure them in place. Next is the tricky part. I’m going to do my best to explain but it can be a little complicated. Go ahead and lay out your strip of fabric in one long piece. Take one end and begin pulling it up and then go down placing the end piece below the longer strip. It’ll and up looking like a sideways 4. Take the end of the piece and fold over a hem and clip your fabric above the strip. This ends up forming a loop that the yoga mat can slide in and out of. Sew a reinforced square over the area that you clipped and repeat these steps for the next side. Once both sides are sewn, your ready to place your yoga mat in there and head off to the gym. I’ve talked a lot about finding the balance in Fibromyalgia with exercise and medicine. An effective medicine that I have found is Curamin® Stop Pain Now and is available at fine health food stores nationwide. Check out the store locator to find a retailer near you or purchase it here. It is safe, effective and non-addictive which is important in finding a medication that’ll help you combat chronic pain. Chronic pain isn’t something that is solved overnight and it’s not something most people can understand unless they’ve been experiencing the same thing. Curamin® doesn’t just mask pain, it gets to the source and stops it. For me, finding balance was the hardest part of Fibromyalgia. There are so many great resources to help you find what helps others but it’s also important to find out what works for you. I’m able to exercise continually because I have learned when my body has had enough and I’ve had a lot of trial and error with multiple medications. Natural is always best in my book but you know your body best and you know what it needs. Find a great doctor that will listen to your concerns and if you feel like you’re not being heard – chances are, you’re not. I’d love to help you more in your chronic pain. What are some questions you have for me? *This post does contain affiliate links. If you love it and buy it, I will receive a small percentage of the sale. Thank you for your support. Finding Nemo is one of my favorite Disney movies of all time because it speaks to just about any situation we’ve ever been in or known someone to be in. Cricut has amazing Disney images and a few Dory images. I’ve included the link to the cut file below but you will need to purchase the Disney images if you do not have any of the cartridges linked to your Cricut. There is a bubbles image and a font that is included in their subscription (which is totally worth it, btw). I’m really excited to see Finding Dory because it’ll just add to the nostalgia that the original movie had for me. So for this post I’m going to show you how to effectively layer iron-on vinyl and how to really get that image to stick to your fabric. First – turn your iron on to about medium-high and the steam off. You want it hot enough but you don’t want it too hot or else it’ll melt the plastic. 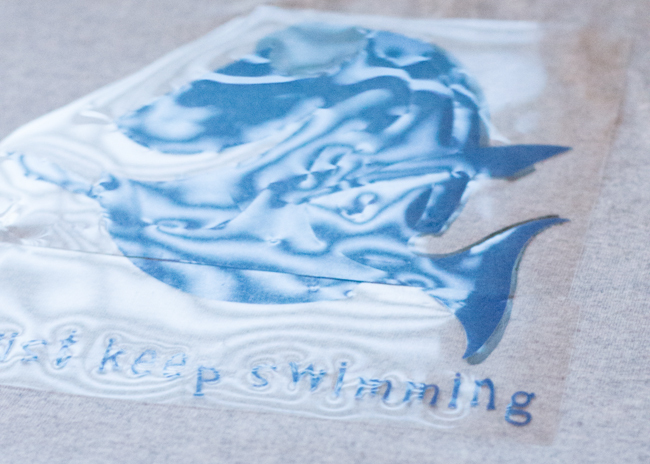 Second – Get your t-shirt warmed up before you place your first piece of iron-on vinyl down. This will help warm the glue and ensure a good stick. Third – Place your first color down. It is important to note that you cannot place any additional vinyl over glitter iron-on vinyl, it will not stick. For me this was the black. Place heavy pressure on your iron and hold the iron in place for around 10 seconds. Between each step, turn the shirt over and iron again using pressure. Don’t try to remove the plastic and iron on top, it will melt. After you’ve ironed it, remove the plastic coating. This will come off fairly easily and it’ll let you know which parts weren’t ironed. Fifth – Add your light blue image. Repeat ironing the front and back using pressure and remove the plastic. Sixth – Add your white eyes, bubbles and then add the smaller navy blue eyelids. Repeat the ironing process. Seventh – Add the yellow using the guidelines and repeat the same ironing technique. The most important part of layering your Iron-on Vinyl and getting it to stick is making sure your shirt is warmed up, you’re using pressure and you’re heating the glue from the front and back. I had a really hard time getting my vinyl to stick once I washed my shirts but this method has helped a lot. 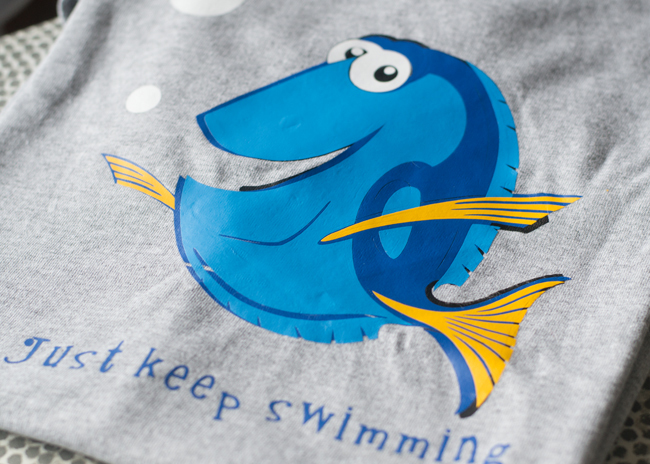 I’m totally wearing this to the Finding Dory premiere and I can’t wait for you all to see the other Finding Dory blog posts sharing everything from crafts to where you can spot her at Walt Disney World. Check that out here. For the file, click here for the Design Space cut file. I hope you enjoy!